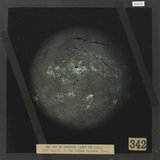 Lithograph in colour, in original binder: Group of sunspots and veiled spots; observed 17 June 1875. Poster, London & North Eastern Railway, Scarborough by Edmund Oakdale, 1936. Fleetwood for Sunshine, Health & Pleasure by LCT, circa 1935.